Emerging Church - Still developing - A newer movement wanting to change things up from traditional ways and teachings. Open Theism - Teaches that through our own free will some (biblical) events are still open and and can be changed. Therefore God cannot know the future 100 percent. Preterism - Teaches that End Time Bible prophecy has already been fulfilled. Social Gospel - Teaches the Churches first priority is to help the poor. Theistic Evolution - Teaches a range of views about how the science of evolution relates to religious beliefs. Universalism - May teach that everyone will go to heaven regardless of their current belief. 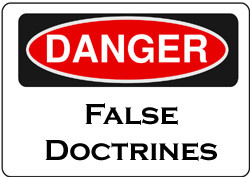 There are many false teachings and doctrines out there. Always reconfirm your position with scripture. God is the same yesterday, today and tomorrow. 1) Definition from Dr. Charles Stanley.